Been a few months since I've run a test to compare. With new exchanges added and new coins wanted to see how the difference was now. So prohashing has closed the gap a bit, I used to get between 10 and 15% higher payouts on litecoinpool. With the jump in coin prices a lot of hashing power has hit LTC and increased the difficulty every 3 days. Last month I was earning almost double the coins, at about half the price so its still on par, no increase or decrease on amount earned per day really. If coins were free to exchange into real $$ it would almost be break even. But with taxes requiring 15% or 33% depending on hold times, just not worth it to mine anymore. Unless you have access to free electricity, scrypt mining is pretty much at a loss. And now with the temps going back up, no need to run HEATERS just to warm the house. Were you running the same amount of hashrate at both pools at the same time? Or, did you mine at one pool for a day, and then mine at a differnet pool the next day? The litecoin difficulty increased within a few hours of the time you started this test, so it would be expected that everyone earned fewer litecoins during the second day. Nope just ran 2 miners a day then switched pools with the same 2 miners. But I started on prohashing on day 1, then 5 hours later the difficulty increased. 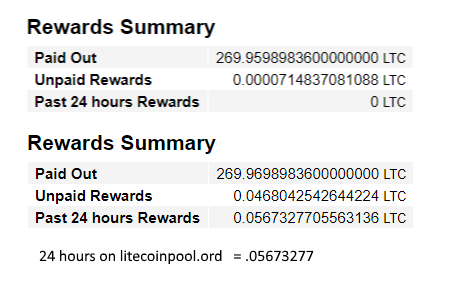 So the 2nd day with the decreased payout due to difficulty was on litecoinpool. So as you point out I earned less on litecoinpool the following test day which was still 9% higher WITH the increased difficulty. So maybe the gap hasn't closed as much as I was giving credit and it is still within the 10-15% that I've almost always seen for scrypt mining.